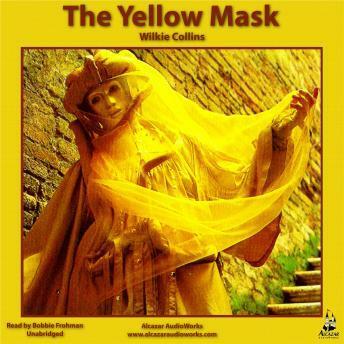 The Yellow Mask, a gothic romance, filled with mystery and suspense, will hold you riveted from beginning to end. A scheming priest, Father Rocco of Pisa, decides the inheritance and great wealth of Count Fabio D'Ascoli was stolen from the Church many generations ago. Father Rocco's brother is a master-sculptor, Fabio's teacher and the father of the beautiful Maddelena. To steal Fabio's fortune, the priest manipulates Fabio's true love, the sweet model Nanina, to leave Pisa. Father Rocco then engineers a wedding between Fabio and his easy-to-control niece. Poor Maddalena dies the next year in childbirth and the priest has to change his plot. The priest tries to drive Fabio mad by having a female henchman don a Yellow Mask and pretend to be the ghost of Maddalena. Fabio's only hope is his beloved Nanina. Can she save him? William Wilkie Collins (1824 - 1889) was a very popular Victorian novelist and a close friend and collaborator of Charles Dickens. Collins was a prolific writer, publishing not only novels, but many plays, short stories and works of non-fiction. Collins sold his first short story at 19, his first novel at 24. Collins had a very successful career as a master of suspense with a distinct narrative voice, filled with social commentary. Wilkie Collins never actually practiced law, but his knowledge profoundly impacted his writing and he is considered one of the godfathers of the ""Detective Novel"".